CLEAN AIR, PERSONAL SPACE, COURTEOUS DRIVERS. All the things you will miss once you arrive in the Guangzhou metropolitan area. “I hate China,” strong words from my brother, Kennie. He claims that he will avoid visiting China again at all causes. I however, do not hate China. Amazing sceneries and hospitality are available outside of the major cities. 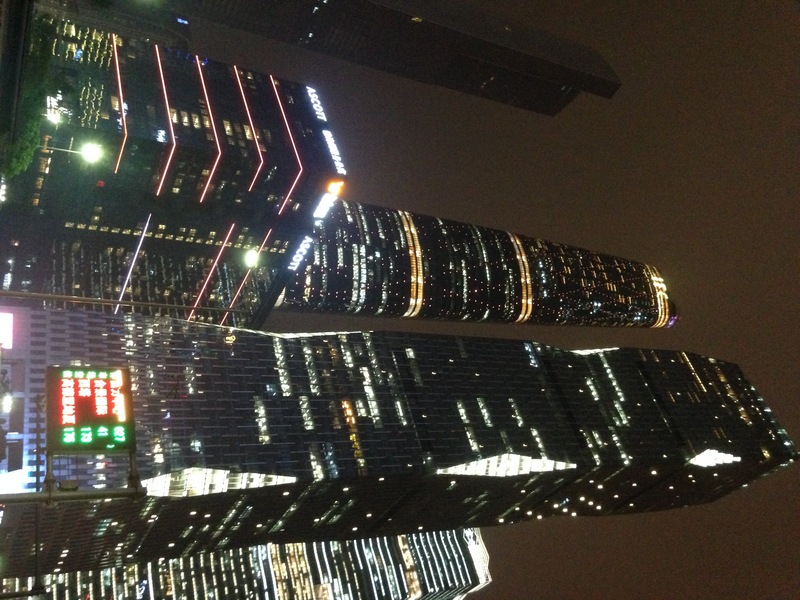 However, our past experiences with the Chinese urban cities were unfortunately too bad to remember. Chaotic transportation, fussy touts and bouts of diarrhea left us with a bad impression. Guangzhou, a Cantonese city with a colonial past and a commercial present, offers more for the business traveler than the leisure one. 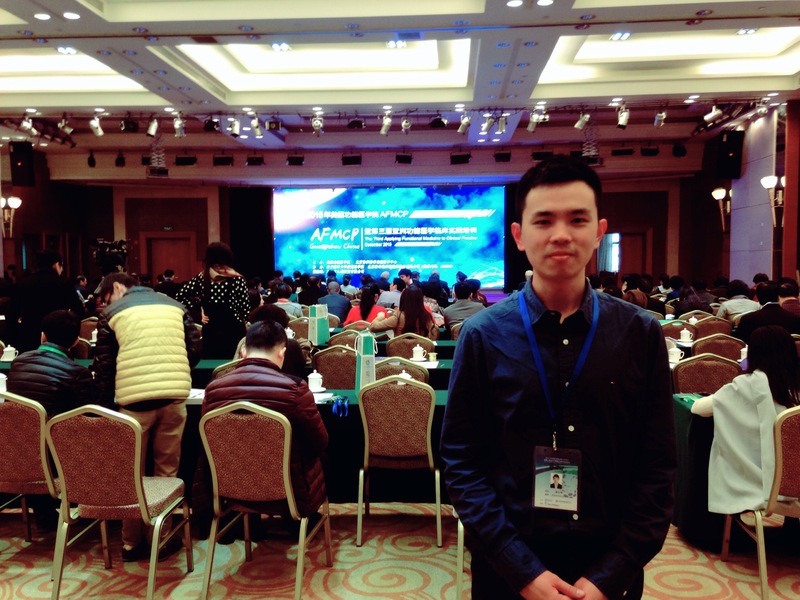 Me and my colleague, Dr. Zhang, travelled here for the annual Functional Medicine conference (AFMCP). This Asian version offers a convenient alternative to the more expensive ones held in the USA. During our week-long stay, I find it hard to stay stress free since every part of the city is congested with either cars or people. The metro ride from our hotel to the conference venue is an event not for the faint at heart. For someone who is not used to squeezing my way to buy a ticket, “compartmentalized” along with dozens of strangers, then “elbowing” my way out of the trains, this is truly a challenge. The conference is an amazing learning experience and the new friendships made it more than worthwhile. Bearing an open mind and patience, we explored the city without any predetermined expectations. PEOPLE EVERYWHERE. And that includes all sorts of animals, both alive and recently slaughtered. 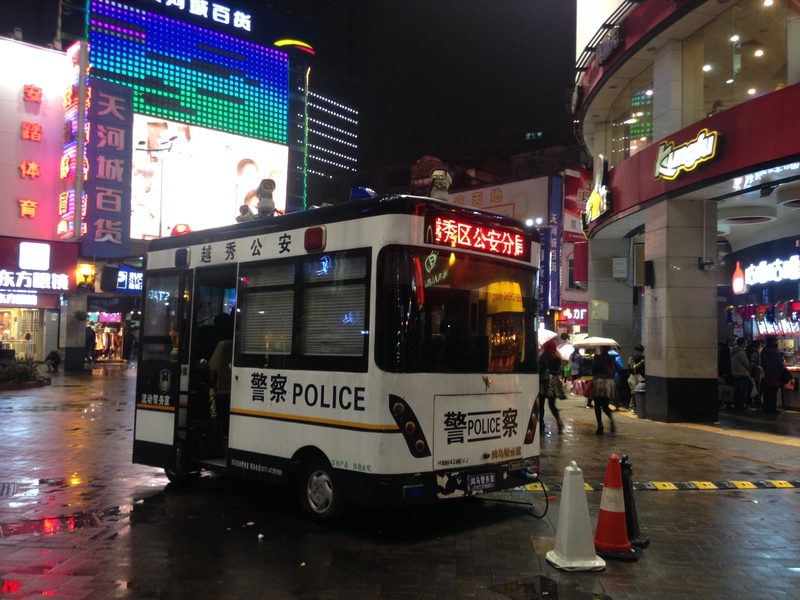 The Cantonese are widely known for their cuisine, from the dishes that dominate foreign stereotypical views of Chinese food (think Dim Sum), to the controversial cruelty that puts off most people (think monkey brain and shark fin soup). Guangzhou is the hub of all things edible. The great upside of being here is that due to tough competition, poor quality food is rare. The best Cantonese and international cuisine are found here at relatively affordable prices. However, be prepared to be bombarded by unappealing sights of dog meat soup advertisement and bloody pool of meats from unknown origin. An additional warning for vegetarians, this is not an easy place to be. 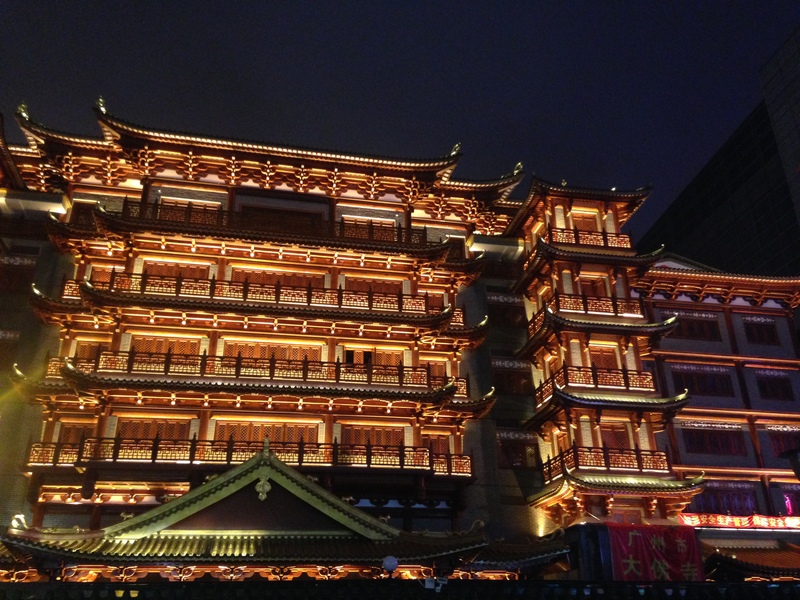 Several interesting museums are available in Guangzhou. Yuexiu Park 月秀公園, the largest park in downtown Guangzhou, has the Guangzhou Museum, Sun Yat-Sen Memorial Hall and the famous Five Ram Sculpture all within its vicinity. Just across the highway is the Museum of the Western Han Dynasty Mausoleum of the Nanyue King. This museum holds the oldest tomb and excavations from the Western Han dynasty. The free guided tours in Chinese are highly recommended. Another fun museum is the Chen Clan Academy, which now doubles as the Guangzhou Folk Art Museum. This being a commercial haven, there are a few pedestrian streets offering a range of products for the determined shopaholic. For example, the BaiMa wholesale fashion district 白馬服飾批發市場 near the Guangzhou Main Train Station covers several blocks of both wholesale and boutique shops. 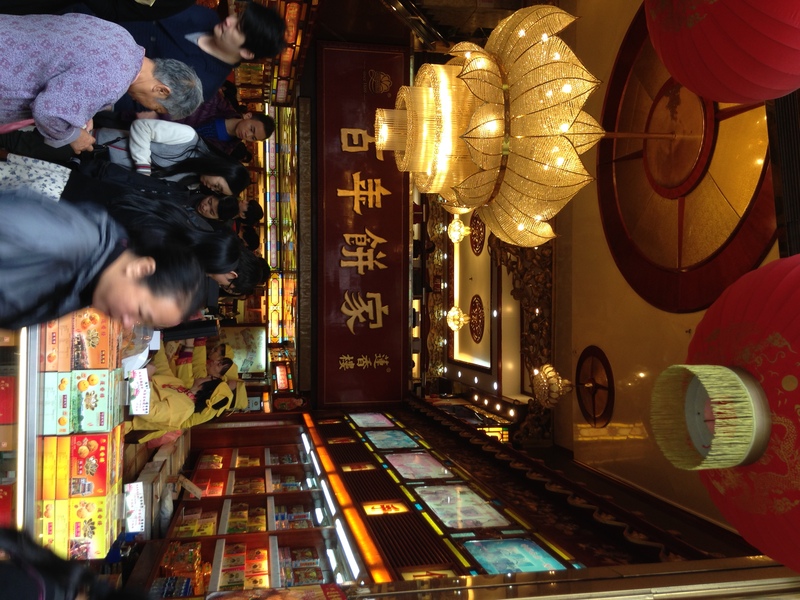 Traditional cookies can be bought at the ShangXiaJiu Pedestrian Street 上下九步行道. If you yearn for electronics, a trip to XinShangGe Electronics 新賽格電子城 and you will find mobile phone brands that you have never heard of (half the price of familiar brands). DR. ZHANG AND I FOUND AN UNEXPECTED MOMENT OF PEACE while on board the new Light Rail, traveling along the Pearl River. This allows us to view the skyline at night. 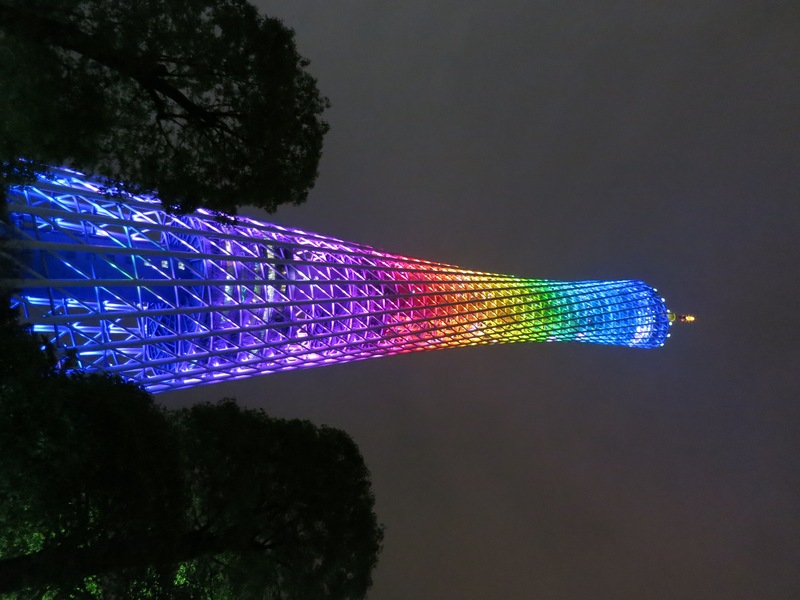 Pearl River cruises are available from the port near the colorful Canton Tower, but the light rail is a cheaper and less crowded alternative. With only a handful of passengers around us, we sighed in satisfaction as our Guangzhou trip comes to an end.